I am interested in using Ezypay to collect recurring payments from my customers. I am applying as a registered business and can provide an active ABN/NZBN or relevant business number. * If you cannot complete all sections of your application for any reason, please ensure you have saved section 1 to be emailed a link to jump back in. All sections that you have saved will be restored. Set up an account in a few easy steps. It only takes a few easy steps to set up an Ezypay account for your business. Here is what you need to do. 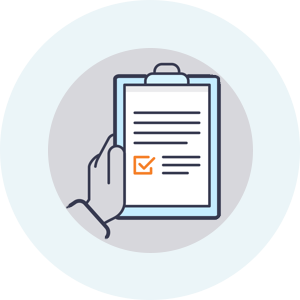 Once your Ezypay application is submitted with all the relevant supporting documentation, your application is assessed by our Risk Department. When your application is approved, we will send you an email with your login details and password. Login and start using your Ezypay account. Our Customer Experience team will be in touch with you to help you get started and provide free training if required. If you need help logging in, or have any general support queries about your account, please contact our Customer Support team. Do you have a question about setting up an Ezypay account? We’re here to help. Browse through the most common FAQ below or contact us directly to ask your own question. Can direct debits be set up as per the customers' preference (i.e. collect weekly, fortnightly or monthly)? Yes, you have the flexibility to alter payment plans to meet your customers' preferences. Easily set up multiple payment plans with direct debit instructions based on term, quantity or usage. Are there transaction fees for direct debit and credit cards? Yes, there are fees for both direct debit and credit card transactions. Fees can be paid by either the business or customer. Is there a fee to load customers into Ezypay? Yes, there is a once-off load fee per customer that can be charged to either the customer or business. What are the sign up cost/monthly fees? Nothing! Opening an account with Ezypay is completely free and there are no monthly or annual fees on the account. The only fees included are the customer load fee when a customer signs up to your business (once-off fee), transaction fee and failed payment fee. Can a customer sign themselves up to a payment plan? Customers will not have access to the Ezypay portal but they can sign up to your payment plans online. A URL link is provided for each payment plan which you can share with customers through email/ website etc. How quickly will I receive the money after it has been collected from my customers? This depends on your chosen distribution cycle (i.e. weekly or monthly). Weekly distributions are collected from Monday to Friday and funds are transferred into your business account on the following Wednesday. If you prefer to have collected funds transferred on a monthly basis, monthly distributions collected throughout the month will be transferred into your account after 3 business days the following month. Is there a minimum amount of transactions that I have to meet each month? No. There is no minimum transactional amount or value that your business must reach each month. Will the business or its customers be contracted to Ezypay for a minimum term? Your customers will not have a contract or minimum term commitment to Ezypay. However, your business will be contracted to a defined term as per the applicable agreement. Will a customer be notified if their payment fails? Yes, when a payment has failed Ezypay will notify your customer of this and provide 2 payment recovery options to resolve the payment issue. Customers can either pay online via the Ezypay online payment portal or by calling our customer service team. What happens if a customer does not pay after their initial payment has failed? Ezypay offers an auto ‘rebill’ option, where we will attempt to collect the payment again from the customer. The rebill option can be customised according to your business’s needs. For each failed payment, you also have the options to change the amount to be collected, change the rebill date, write off, or add the outstanding failed amount to the next payment to be collected. Can a customer update their payment details online? Customers can get in touch with your business directly to update their payment details. They are only able to update their payment details and pay any outstanding amount on the Ezypay Online Payment Portal in the case of a failed payment. Once the payment is rectified, they can opt to save the new payment details for the next debit collection. Yes. There is a failed payment fee that is charged for every payment that fails. This charge applies to payments that have failed due to insufficient funds, invalid account details, cancelled cards and blocks that have been put on the account. What reports do Ezypay offer? Ezypay provides 8 real-time reports which you are able to run anytime on our basic platform offering. Reports include the Distribution Report, Transaction Details Report, Outstanding Failed Payment Report, Distribution Tax Report, Customer List Report, Invalid Customer Details Report and Change Event Report. A 9th report, the Trend Analysis Report, can easily be provided as an additional service. This powerful report enables you to track your business’s progress on a month-to-month basis. It captures trends in customer billing, transaction value and failed payments value and volumes. How do I download the customer list for my business? Your Customer List Report is located under the REPORTS tab on our secure site. You can generate the report in real time and export the data in popular formats, including PDF, CSV and Excel. Yes! We are PCI compliant – the highest payment security accreditation. Our processes ensure that all sensitive business and customer details, billing, payments and card processing have been handled at the highest level of data security. Ezypay customer service is available from 8am to 6pm on Monday to Friday (GMT+10). However, the Ezypay secure site is accessible online 24/7, worldwide. Can I see a demonstration of Ezypay's recurring payment solution? Yes, you can book an Ezypay demo online, today! During this one-on-one demonstration session, our Recurring Payments Specialist will discuss your needs, answer any questions you may have, provide recommendations and help you get ready for automated subscription billing.